Make your dream of acquiring a brand new car come true at the start of 2018 by joining Citi’s GoWithCiti promo. Drive home one of three BMW 2 Series Gran Tourer MPVs or be one of the ten winners of a luxury watch worth P250,000 from Lucerne! “We always want to make it more fun and exciting for our clients. With the GoWithCiti campaign, we look forward to seeing our clients enjoy our products and services, as well as the perks and amazing prizes that we prepared for them,” said Vishal Kadian, Acting Head of Cards and Loans, Citibank, N.A Philippines. Simply use your Citi credit card until January 31, 2018 to earn raffle entries. Each swipe earns you one raffle entry so the more you swipe, the more chances you have of winning. There’s no minimum spend required! Winners will be drawn on February 14, 2018, and will be notified via phone or email. They can claim their prizes at Citibank Square by presenting the official notification letter from Citi, card used for the winning transaction, two valid IDs and valid TIN ID. Plus, register at www.winwithciti.com to earn even more raffle entries and win over 100,000 instant prizes. Simply create an account using any active email address and your unique log-in password and earn play codes every time you swipe your Citi credit card. Each play code can win you Nike Park, Vikings, Bistro Group, Bruno’s Barbers or Mrs. Fields eGIFTs, an e-voucher from ZALORA, UBER credits for P50 off on your next 2 rides, and a 3-month subscription at IFlix. If no instant prize is won, you will get ten additional raffle entries for the raffle. To redeem your instant prizes, just go to the My Rewards page on your www.winwithciti.com account for detailed instructions. Start the year right and win amazing prizes. GoWithCiti now! 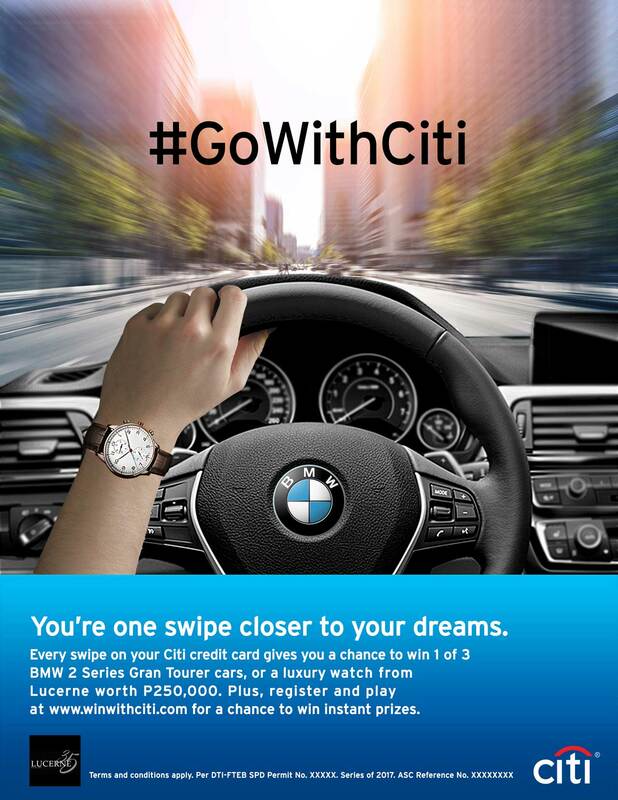 For more information, log on to www.citibank.com.ph/bmw.